Last week, the Congressional Budget Office released its annual 10-year projection for the U.S. government’s budget and economic outlook. 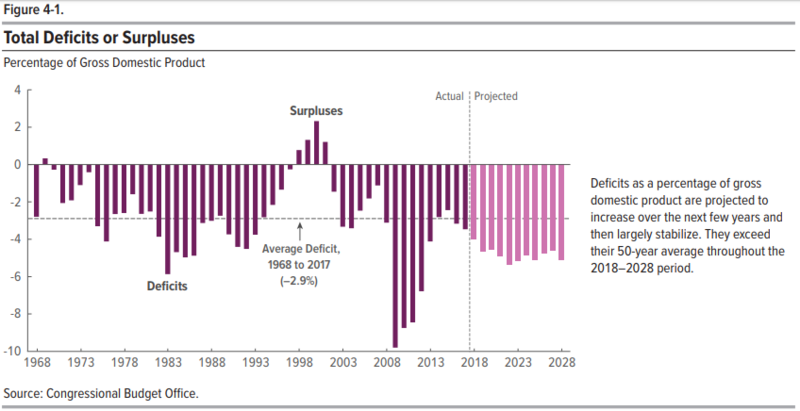 What makes this year’s outlook stand out from previous editions is that the CBO’s analysts have taken the effects of the significant tax cuts and spending increases that have recently passed into law into its accounting, which the following chart from the report summarizes in visual form. Simply put, the CBO expects that the U.S. government’s tax collections will continue to keep pace with their historical average as a percentage of the nation’s Gross Domestic Product, while spending is set to grow to far exceed its historic long term average. Together, the combined effects of the tax cuts and spending increases will herald the permanent return of annual trillion dollar deficits two years earlier than the CBO had projected a year ago. The only good news here is that since the economy has grown since the days of President Obama’s trillion dollar deficits, the red ink is relatively more affordable as a percentage of GDP, where the CBO projects annual deficits as a percent of GDP will be consistent with what was recorded during the early 1980s. Since excessive spending is the biggest driver of those future annual budget deficits, the CBO identifies which major budgetary categories are the main contributors to the spending growth it projects. The biggest contributor to future budget deficits continues to be “mandatory” spending, which in this case, represents the combination of money spent to provide Social Security, Medicare and Medicaid welfare program benefits. 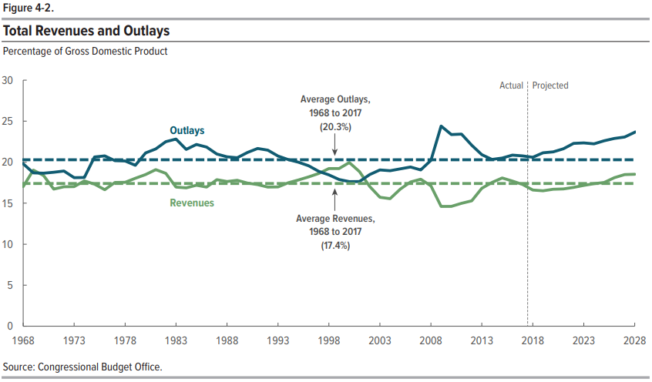 But, the biggest change perhaps is the category of “Net Interest”, where the cumulative effect of borrowing to sustain its spending and higher interest rates causes this “mandatory” budget category to grow much faster than the CBO had previously projected. As interest rates rise, payments on federal government debt also increase. The U.S. Treasury Department’s Monthly Statement for February 2018 confirms a 7% increase in the U.S. government’s gross interest payments on debt securities issued by the U.S. Treasury for the first five months of the U.S. government’s 2018 fiscal year (October 2017 to February 2018) as compared to the same period of time in its previous fiscal year, where higher interest rates are the main factor behind that increase. The bottom line is that the U.S. government needs to do much more to bring its excessive spending down to more fiscally sustainable level.